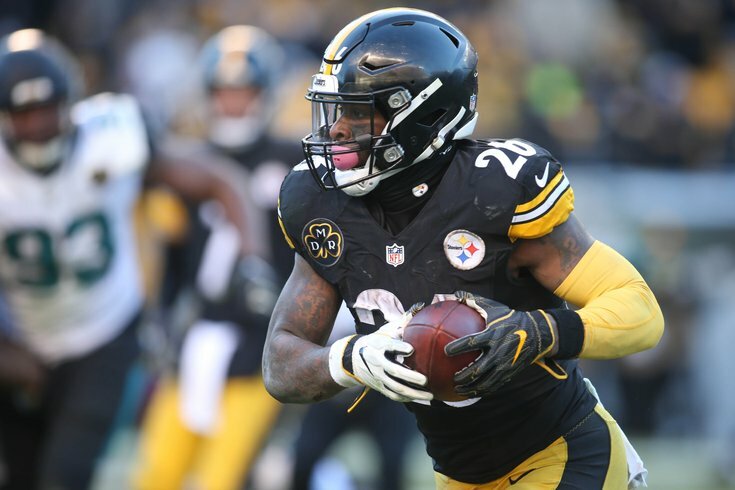 What they're saying: Would trading for Le'Veon Bell make sense for the Eagles? Pittsburgh Steelers running back Le'Veon Bell. If you clicked this headline hoping to find reasons why the Eagles should go after disgruntled Steelers running back Le'Veon Bell, I'm sorry to disappoint you. It's not happening. While Pittsburgh has recently made the All-Pro back available via trade after he's failed to report this season, upset over the team's decision to place the franchise tag on him rather than sign him to a long-term deal, the reality when it comes to the Birds — who could use some backfield depth with oft-injured Jay Ajayi and Darren Sproles still not 100 percent — is that they just don't have the cap space to make a move. A new Bell in Philly? Sorry, guys. The answer is still no. While Roseman has been more than willing to make trades — and the Eagles are certainly in the business of adding talent to aid their Super Bowl defense — this just doesn’t seem like the right move for the Eagles. Bell wants to be paid and he wants big money — think Todd Gurley’s $21.95 million guaranteed and $14 million annual contract value. The Eagles currently have just $5,305,588, per Over the Cap. On top of that, the Eagles are projected to be $20,062,232 over the cap heading into 2019. Carson Wentz returned on Sunday. Carson Wentz won on Sunday. And his teammates (and coach) were impressed, despite a less-than-stellar* performance from the Eagles quarterback. Wentz was an engine that helped the Eagles churn along on an afternoon that still had its fair share of hiccups and setbacks. But Wentz did what's become custom: He won. In his past 16 starts dating back to the end of his rookie year in 2016, Wentz is 14-2. There are high hopes for the reigning Super Bowl winners. One of the team's taglines is that this is the "new norm." Wentz is a significant part of that. And he's back. *Compared to what we saw last season. The Eagles are 2-1 after three weeks, just like they were last season. Furthermore, just like last year, this isn't a team that looks poised to make a Super Bowl run. But, as Jeff McLane points out, the signs are there. And they might just be getting started. 1. The Eagles are still an enigma. Great teams find ways to win ugly. It's a cliché, of course, and the Eagles dug deep on a day when the offense was scattershot and team-wide penalties (10 for 110 yards) hindered their chances. But the jury is still out on whether this is a great team. The bones are there. Most of the players know what it's like to win or come close to winning each week. But the Eagles have yet to put together a cohesive 60 minutes. And yet, they're 2-1, just as they were last season when they needed a 61-yard, last-second field goal to have a winning mark through three weeks. Did anyone, outside the team or the eternal optimist, believe the Eagles were championship caliber a year ago? Malcolm Jenkins told us last week in Safety Blitz that there was no chance this team had a Super Bowl hangover. And while it hasn't always been easy to agree with him, he has a point. Nothing has come easy for this Eagles team. They’ve been out of kilter on offense for large portions of all three games. They’ve given up way too many big plays on defense. They have yet to play anything approaching a complete game, but they’re 2-1 because they’ve battled for 60 minutes in all three games. And that's the biggest thing you look for with a team coming off a championship. Do they still have that fight? You see it on those crucial third downs that they absolutely have to convert. You see it in the red zone, when the defense absolutely has to get a stop. You see it in the fourth quarter, where they’ve outscored their three opponents 22-9 so far. As Reuben Frank alluded to, the Eagles defense has been great when it matters most. For the second time in three games, the Eagles' red-zone defense took center stage. Jim Schwartz's unit fended off four of five red-zone challenges in the Eagles' 18-12 win over the Falcons in Week 1, and repeated the trick Sunday. The Colts scored on their first red-zone trip late in the first quarter when Andrew Luck hit wide receiver Ryan Grant with a 5-yard pass over cornerback Ronald Darby to cap a 55-yard march after a 55-yard field-goal miss by Jake Elliott gave them a short field. Dallas Goedert, who had been missing much of the season before Sunday, caught his first NFL touchdown against the Colts. And with Wentz, who has a history of targeting his tight ends, back in the fold (not to mention all the injured wideouts), there's a good chance we see more of the rookie tight end moving forward. Eagles coach Doug Pederson has openly mentioned how the team needed to get Goedert more involved. Now, even with receiver Alshon Jeffery likely returning soon, Goedert should continue to play a vital role in this team's offense. "He's earned it," Pederson said. "It's just time to play and cut him loose a little bit and don't keep him back ... as he gets more and more comfortable with the offense, he's just going to get better and better."